Due to the closing of the 61Extensions site and the abandonment of their plugin, the Troubleshooting Guide is out of print and no longer available for sale. A frequently asked question about the QuickBooks-WooCommerce plugin by 61Extensions.com is, "Can the plugin upload products from my QuickBooks installation into WooCommerce?" The simple answer is, "No, it can't!" Many WooCommerce users buy variations of the 61Extensions plugin in the hope of seamlessly integrating the eCommerce solution with their QuickBooks Desktop or Point of Sale system. 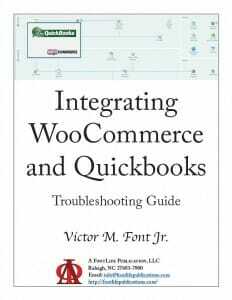 After days, weeks or sometimes a month or more, someone will find one of my QuickBooks-WooCommerce articles or purchase the Quickbooks-WooCommerce Integration Troubleshooting Guide. In many cases, the troubleshooting guide is sufficient to help the user solve their problem with setting up the plugin. Once the plugin is setup, it works nicely and it's pretty much hands-off from there. The QuickBooks Connector Extension for WooCommerce seamlessly transfers orders, customers and inventory to your QuickBooks software. Notice the phrase I bolded and underlined for emphasis? It says, "to your QuickBooks software." This means that new inventory item additions and synchronizing them between WooCommerce and QuickBooks is a one-way sync from WooCommerce to Quickbooks. Inventory already in Quickbooks and not yet in WooCommerce will not transfer to WooCommerce. You have to set the products up in WooCommerce first, then they will transfer to QuickBooks. Only after you have your products setup in both WooCommerce and Quickbooks will the quantity and pricing synchronization work bi-directionally. So what happens if you setup your inventory in QuickBooks first? I recently had a client call and ask me to help with this problem. They have over 8,500 products in their QuickBooks POS system and want 855 of them, all in one specific category, transferred to their WooCommerce installation. The only answer that can support this request is Export/Import, but unless you have a technical background, there is no easy solution. QuickBooks provides functionality to export your entire inventory list to an Excel spreadsheet. You have to create a spreadsheet first and then tell QuickBooks that that is the spreadsheet you want to use. If you want to load your entire inventory into WooCommerce, then this is fine. But what if you only want to load a subset of your products, as this client requested? Then you have to sort your spreadsheet by category and item number, if you have a category setup, then delete all of the extraneous rows and export the remaining items from Excel to a CSV file. It's all a little complicated, right? That's not even the hard part! Now you have to import the CSV into WooCommerce. But wait! There's no way to do that unless you buy another $200 plugin! Then you have to learn how to use the plugin, map the exported data to WooCommerce fields and import the CSV file. If you make mistakes or something doesn't go right, you're right back to square one. The alternative, is that you can save a lot of time and frustration if you ask for my help as soon as you can. I've helped many, many users get their WooCommerce/QuickBooks integration working properly and the time we've spent together has never exceeded 4 hours. I've had about a 98% success rate. Sometimes, because of hosting policies or server configurations, there isn't anything we can do to make the plugin work, but what have you got to lose? Start by purchasing and downloading the Quickbooks-WooCommerce Integration Troubleshooting Guide. It's only $7.95 and it may be able to save you hours of frustration. Just click the button below to add it to the cart. If the troubleshooting guide doesn't help you, then give me a call. What's a 4-hour investment worth compared to the days, weeks and hours you've already spent driving yourself crazy? If you’re interested in a way to reduce the stress of copying all of those products over (from QB to WooCommerce or WooCommerce to QB) and sync all data both ways automatically check this plugin out the MyWorks Software WooCommerce Sync for QuickBooks Those 855 products could have been synced over with one click. It’s available for QuickBooks Desktop too. Thought you might want to check this out! Great article! Manually syncing data from QuickBooks to WooCommerce and WooCommerce to QuickBooks isn’t easy! I’m glad you’ve found a way to make it work.